This high efficiency semi-flexible 80W dual battery solar charging kit is perfect for permanent outdoor use to provide free electricity for charging 12V batteries to power various applications, such as in a motorhome, caravan, camper, boat, or for solar lighting systems, off-grid and back up solar power systems. 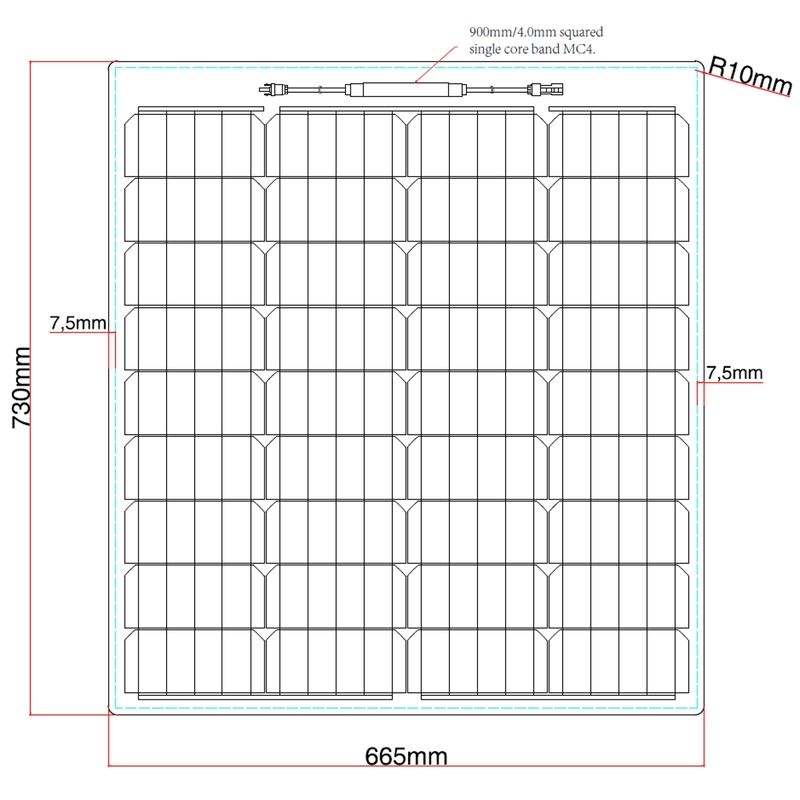 This reinforced semi-flexible solar panel has a unique 7-layer construction, featuring an embedded sheet of anodised aluminium fully encapsulated within the solar panel. This additional reinforcement offers greater strength and resilience, making this one of the most robust semi-flexible solar panels available on the market. In addition to the aluminium reinforcement, the surface of this 80W semi-flexible solar panel is made of strong ETFE material which has a longer service life compared to standard semi-flexible solar panels. As a result, these particular semi-flexible solar panels are extremely hard-wearing and less prone to cracking , delamination and corrosion. The lightly textured coating of this panel creates an anti-reflective surface which allows the panel to absorb a far greater amount of light, thereby increasing efficiency. ETFE material has long been used in applications where durability and high-temperature resistance is required, such as in the Eden Project, Cornwall. You can read more about ETFE and its benefits here. The high-efficiency monocrystalline German solar cells used in this solar panel have excellent performance in low light conditions (particularly when compared to solar cells of unknown origin) and they produce a good amount of power even in daylight - when direct sunlight is not available. This panel also features innovative 5 busbar solar cells, which are more efficient than the 2, 3 or 4 busbar solar cells used in most other solar panels, and are able to extract more power from the same surface area. The semi-flexible design of this panel makes it ideal for curved roofs and surfaces where bonding is preferable (though the panel can also be fixed by bolts or screws). The panel is also incredibly light (only 3.10kg) which makes it an ideal option for all vehicle applications. This panel is also highly resistant to salt water environments and it is also possible to walk on the panel, making it the perfect choice for boats and yachts. The panel is fitted with 2 x 1m of cable with MC4 connectors on the end which simply plug into the 5m extension solar cable supplied with the kit, to join the solar panel and the charge controller. This is a perfect solar controller for a caravan / camper van / boat or another system with two batteries (e.g. engine and leisure battery) or battery banks. You can set the initial charging priority e.g. 80% power to go to the engine battery and 20% to leisure battery. When one of the batteries is fully charged the controller will automatically divert all power to the other battery. Can the unit work with only one battery? Yes, absolutely! The controller will determine automatically if there's only one battery connected and will pass 100% of charging current to this battery. You can add a second battery later. The unit has numerous safety functions, including protection against reverse current at night (from the battery back to the solar panel), over charge, short circuit, reverse polarity etc. Other features include various LED indicators, battery type selection (sealed, gel, flooded) and an RJ-45 socket for an optional remote LCD meter with 10m cable. A built-in temperature sensor allows the controller to optimise the charging process depending on the ambient temperature. If you are planning to position the controller far away from the battery, or if the battery and the controller are exposed to different ambient temperatures, an external remote temperature sensor with 3m cable is recommended for this dual battery solar charge controller. To enable connection to the screw terminals of the controller, the green connector block on the end of the remote temperature sensor cable should be cut off. The solar charge controller is compatible with sealed, gel and flooded lead acid batteries. The kit also includes a pair of 5m positive and negative solar extension leads (4mm cross section) and 5m of 4mm dual core battery cable for use between the solar charge controller and your battery, making the total cable length between the solar panel and the battery 1m + 5m + 5m = 11m. Please note: due to our warehouse arrangements, the solar charge controller and accessories may be shipped from a different warehouse to the solar panels and therefore delivered in a separate package. The panels are covered by a 1 year repair or replacement warranty provided by Photonic Universe. We will repair or replace defective items at our discretion. The solar controller is covered by a 1 year manufacturer warranty. For more information please refer to our Terms and Conditions. In addition, solar cells are guaranteed to produce at least 90% of nominal power in 10 years after purchase and at least 80% of nominal power in 25 years after purchase. This warranty is provided by the manufacturer of solar cells. For installation advice, please click on the Installation tab. Electrical connection: the solar charge controller included in this kit comes with a detailed user manual which contains a wiring diagram and explains installation / operations (see Documents tab). Please ensure that you read the full user manual before starting the installation. Fitting: before installing these solar panels, please read the handling and fitting guidelines, available to download in the 'Documents' tab. The solar charge controller in this kit is not waterproof and should be mounted indoors. If you need help with installation or have any technical questions we can provide FREE support - please contact us by email or phone (see Contact Us page for more information).